Color(s): black and tan, sable, and black. The German Shepherd Dog is a handsome, well proportioned and a powerful creature. The breed is sociable, direct and fearless, with a strong, athletic body, and alert expression. His nose is most often black; jaws are strong, with a scissor-like bite. The eyes are medium-sized and brown with a vivacious, intelligent, and confident look. The ears are large, stand erect and his tail is shaggy. 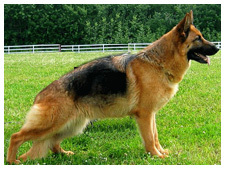 The German Shepherd Dog is longer than tall, deep-bodied, and presents an outline of smooth curves rather than angles. His coat is straight, hard, and medium in length, and he also has a dense undercoat. The coloring of the German Shepherd Dog can vary and includes black and tan, sable, and black. His weighs in at 60-80 pounds for females, and 75-100 pounds for males. Due to their loyal and protective nature, the German shepherd is one of the most popular breeds. This is an alert, energetic, loyal, and very intelligent breed. The breed is so intelligent and learns so readily that it has been used as a sheepdog, guard dog, in police work; they are also used as a guide for the blind, in search and rescue service, and in the military. They are considered to be the third most intelligent breed of dog, behind Border Collies and Poodles. These dogs are obedient and very quick to learn. He is one of the easiest of all breeds to train due to his high intelligence. Whining can be a problem with the German shepherd, as some will whine a lot. This breed has a distinct personality marked by a self-confidence and fearless, but not unfriendly, appearance. The German shepherd is known for its protectiveness too, and therefore makes a very affective watchdog; he will not back down if he feels that he or his loved ones are being threatened. Is German Shepherd the Right Dog Breed for You? The German shepherd is a loyal family pet and a good guard dog, the ideal choice for many families. He is known to get along very well with children, although you should bear in mind his size if you have younger children. They should be trained and socialized from an early age, these are very capable dogs, and are eager to please their owners, although their personality makes them best suited to those with some experience of dog ownership. German Shepherd Dogs love strenuous activity, preferably combined with training of some kind, these dogs are very intelligent and like to confront challenge. This is not a breed that will be happy simply laying around your living room or locked out in the back yard. Most shepherds love to play ball or Frisbee. Ten to fifteen minutes of fetching along with daily walks will tire your dog out quite sufficiently as well as give him some sense of purpose; if the required exercise is not provided, the German shepherd can become restless and destructive. The life expectancy of the German Shepherd Dog is around 13 years. There is a number of health problems associated with this breed. This includes spinal problems, eye problems, epilepsy, and pancreas problems. There are some other genetic problems such as color-paling, hip dysplasia, monorchidism, weakness of temperament, and missing teeth are common, as well as turned or folded ears which never fully turn up when reaching adulthood. The German shepherd will need regular exercise, including daily walks and regular runs.You will need to ensure that you provide your German shepherd with physical and mental stimulation; these dogs do not fare well when isolated or neglected. The grooming requirements for the German Shepherd Dog are not excessive, and brushing his coat every couple of days should help to control shedding, although you will need to step up the grooming at certain times of the year when he is shedding more heavily. Check ears and trip claws regularly and bathe only when necessary, over bathing can cause skin irritation from oil depletion. German Shepherd Dog is a heavy shedder all year round, and is therefore not well suited to allergy sufferers.